Eidolon from Canada have been one of the very few bands who could convince me that power metal doesn't always have to be boring or annoying. Their last two CDs Hallowed Apparition and Coma Nation were two excellent albums sounding as great US metal did about 15 years ago. While listening to their sixth album Apostles Of Defiance, the two first songs Scream From Within and Volcanic Earth nearly knocked me from my office chair (true metal people listen to music while sitting on beer crates; ed.). Eidolon's new sound is much more technical, it's a kind of modern thrash metal where the music reminds me of Voivod and the vocals show parallels to Flotsam & Jetsam and Metal Church. In general, Eidolon have become much more aggressive than ever before and especially the vocals contain much more growls than it was the case in the past. Volcanic Earth is even containing a flair of death metal. The album also contains less technical but nevertheless good classic power metal songs like Twisted Morality or The Test. 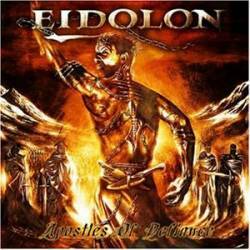 To prove that their metal repertoire is really broad, Eidolon put on their CD two longer epic songs called The Will To Remain and the title song itself. Normally pure metal is not my favourite kind of music, but Apostles Of Defiance is a really amazing metal album (although it's containing lots of 'guitar lessons') which can only be recommended to each metal freak. No doubt that this is Eidolon's best work so far.